Conference play starts today and what an amazing slate of games! We will also welcome Jess Ceresino aka The Sports Brat for some girly-girl football lifestyle chat! 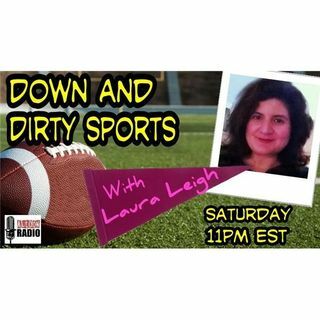 As always, the Hottie Coach List and other sports stories so come get "Down and Dirty" with Laura Leigh! Aw yeah that;s why I picked it! thanks for being here tonight y'all! Probably poked fun at the email thing? Now teams have film on Weeden too, Stan. Falcons are not going to lose at home to Ryan mallett.